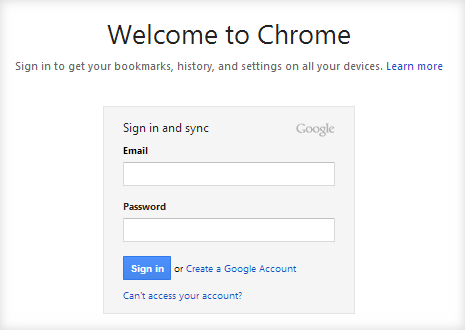 Switch Google Accounts Without Logging Off In Chrome. A lot of us have more than one Google accounts with different Gmail addresses. For instance, I have two and use one of them as my personal email id and the other to register in websites. Unlike the personal one, the second one is only checked once in a while. But whenever I do want to check it, I need to log off and login with the second email or use a different browser. You can do it by starting a new Chrome window separately in incognito mode. But this is too tedious to do every day. Google Chrome's "Profiles" feature provides an easy and simple way to switch between Google accounts without leaving the browser or having to log off. Let's see how to create a profile. Click on the face icon on the top left of your chrome browser. This will show a popup with existing profiles. Click on "Create User" which will show a login page in a new window. Here, you need to enter your gmail id and password. Once logged in, the credentials and login is stored against this profile. You can create as many profiles as you want. 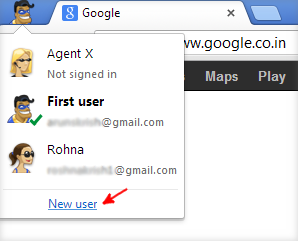 When ever you select a profile, a new window will open where you will be automatically logged-in with the profile's Gmail id. The same will be true for all tabs you open in that window. Finally, here's a video tutorial on creating profiles and profiles in action. How to Backup All Your Youtube Videos to Google Drive. Preview Multiple Files, Photos, Videos and Pdfs In Google Drive - Complete Guide. Add Facebook, Twitter and Google+ Apps to Windows 8 Metro UI. Automatically Mark Old Unread Emails in Your Gmail as Read. Get a Read Receipt for Your Gmail Without Using Google Apps. Do you want to switch between your Google accounts without logging off or using a different browser? Here's how to do it in Google Chrome.